The London Mint Office are proud to be the official distributors of Marvel coins within the UK and to reach out to our Marvel fans, The London Mint Office appeared at 2017 MCM Comic Con at the London ExCel. The event is the largest of its kind across the UK and saw over 130,000 in attendance over the course of the weekend! During the build up to Comic Con, The London Mint Office worked closely with MCM to produce something special that attendees could take home and treasure forever. As one of the UK’s largest commemorative coin and medals distributors, The London Mint Office produced the world’s first official MCM Comicoin! 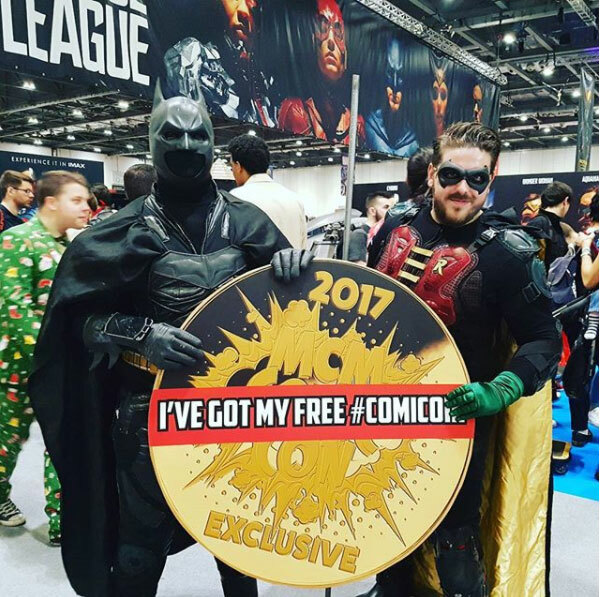 The Comicoins were gold plated and featured the MCM Comic Con branding on the front, with The London Mint Office on the back, and were completely free on a first come first served, one per customer basis. Aside from the extremely popular Comicoin, The London Mint Office were also premiering a BRAND NEW set of coins known as the Marvel Light Up Range featuring Spider Man, Captain America & Iron Man. Comic Con London was the first place in the UK to see these exciting new coins prior to general release and proved to be a hit with Marvel fans.